First production teaser for the documentary. The lighthouse has often been the centre of many debates around this story. I carried out some test shots to see how the lighthouse would appear from the forest edge. They were filmed on the 16th of April 2008. These shots were taken along the edge of the field, bordering the eastern end of the forest. Filmed to establish the view of the lighhouse from various points along the field and at varying focal lengths, both of these are given as approximate. The camera used was a Sony FX1e HDV camera. I filmed from 2 locations along the forest edge, both North and South of the established landing site, which I believe is a few yards behind the picnic bench. As you can see the window of view of the lighthouse during the winter time runs for approximately 100 yards. The lighthouse appears to have an orange glow in these shots. 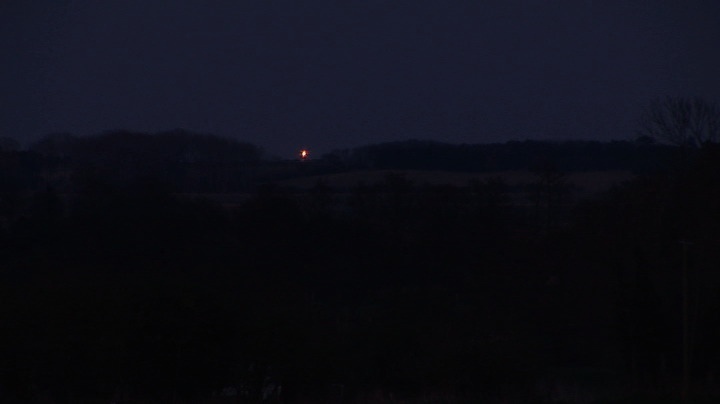 In fact, I tried to white balance correctly when I arrived at the site and the lighthouse beam appeared very falsely red. i returned the camera to one of the preset white balance settings and as can be seen the ground coverings have a very blue cast ( something I hate to see in shots ). As I knew that it would soon be dark I left the camera at this setting, so that the lighthouse colour didn’t appear too enhanced. I have made a colour corrected still image below, to return the image closer to it’s natural colour balance.